The 1942 USGS topo map depicted the Brennan Airpark as an irregularly-shaped outline with an unlabeled propeller symbol on the east side of Fairfield. The date of construction of this small general aviation airport has not been determined. 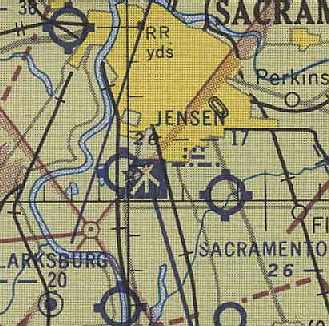 Brennan Airpark was not yet depicted on the September 1942 Sacramento Sectional Chart (courtesy of Ron Plante). The earliest depiction which has been located of Brennan Airpark was on the 1942 USGS topo map. It depicted an irregularly-shaped outline with an unlabeled propeller symbol on the east side of Fairfield. The earliest aeronautical chart depiction which has been located of Brennan Airpark was on the March 1944 Sacramento Sectional Chart (courtesy of Ron Plante). 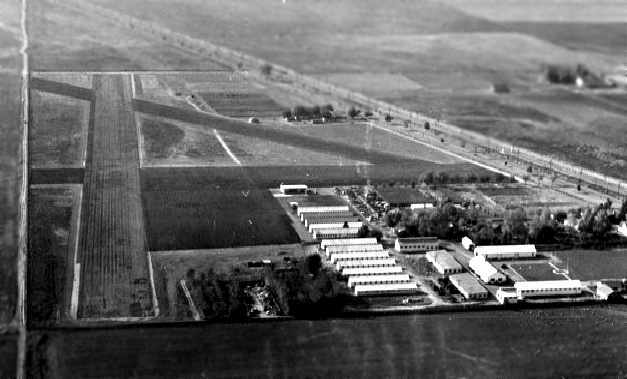 It Brennan as an auxiliary airfield located adjacent to the east side of the town of Fairfield. Brennan Airpark was depicted in an unchanged fashion on the December 1944 Sacramento Sectional Chart (courtesy of Ron Plante). as that is how it was depicted on the February 1948 San Francisco Local Aeronautical Chart (courtesy of Tim Zukas). 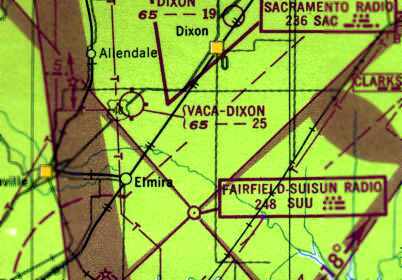 It depicted Fairfield-Suisun as having a 3,500' unpaved runway. 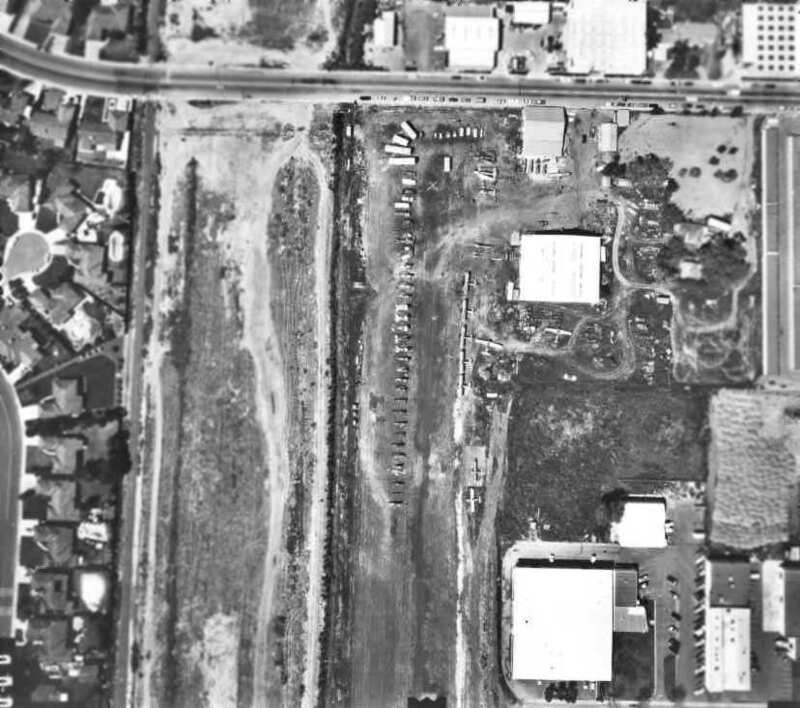 The only dated photo which has been located of the Fairfield Suisun Air Park was a 3/8/48 USGS aerial view. with a few small buildings & 14 single-engine aircraft on the southeast corner. The 1949 USGS topo map depicted Fairfield Suisun Air Park as having a few small buildings on the southeast corner. showing a massive Air Force RB-36D with Fairfield Suisun at the bottom-right. Kriby Stevens recalled, “Fairfield Air Park... In the mid-1950s, the airpark was run by A.D. 'Bert' Waite. He would buy surplus AT-6 & BT-13 airplanes, remove the engines & install them in Stearman biplanes & make them into cropdusters. 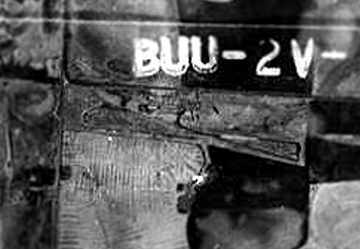 I got the front half of BT-13 & had it in my garage. Bert was an A&P inspector for the FAA as well as a pilot. He had several interesting planes on the field besides the AT-6s & BT-13s. I remember getting rides in his Cessna T-50, Howard, Ryan PT-19 as well as Taylorcraft & Ercoupes. as it was no longer depicted on the March 1961 San Francisco Local Aeronautical Chart (courtesy of Tim Zukas). 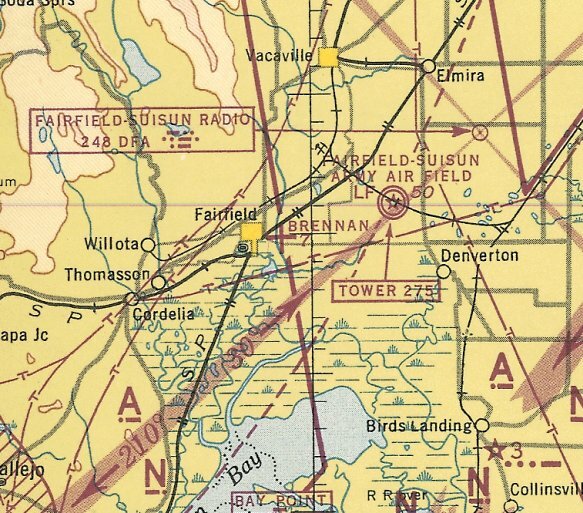 The 1969 USGS topo map still depicted the Fairfield Suisun Air Park in an unchanged fashion. The 1980 USGS topo map depicted streets having been constructed over the site of Fairfield Suisun Air Park. 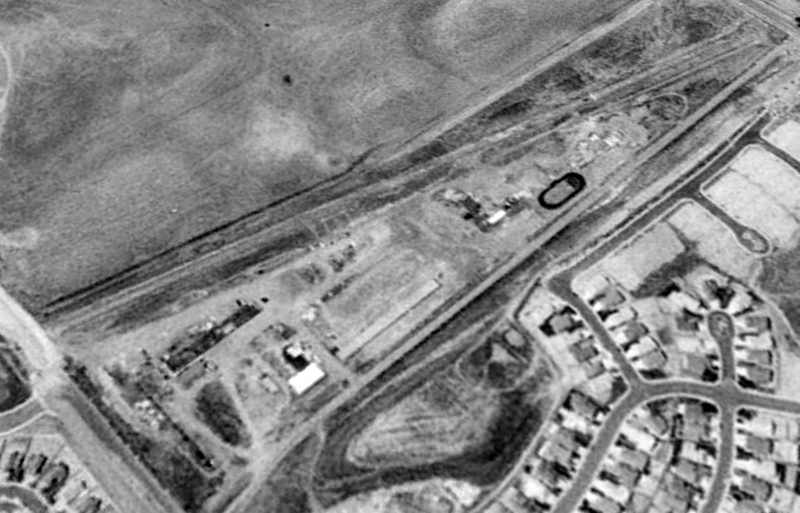 A 1993 USGS aerial photo showed no remaining recognizable trace of Fairfield Suisun Air Park. 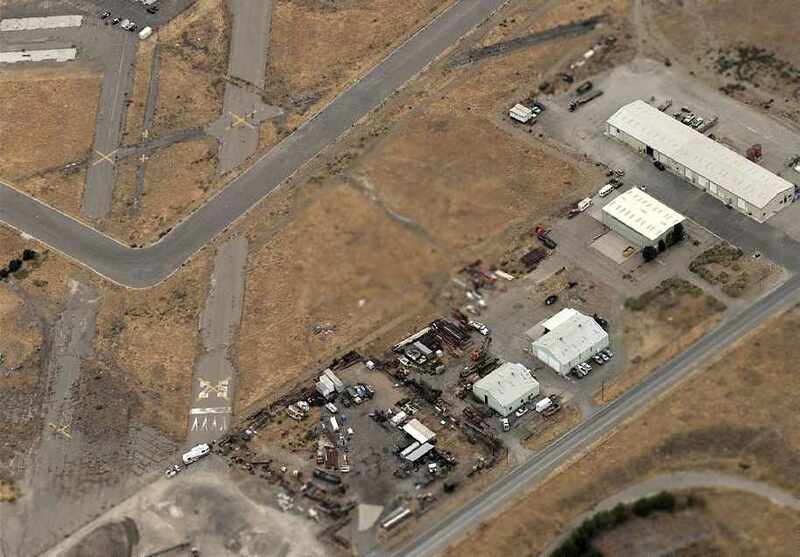 A 4/16/13 aerial photo showed no remaining recognizable trace of Fairfield Suisun Air Park. 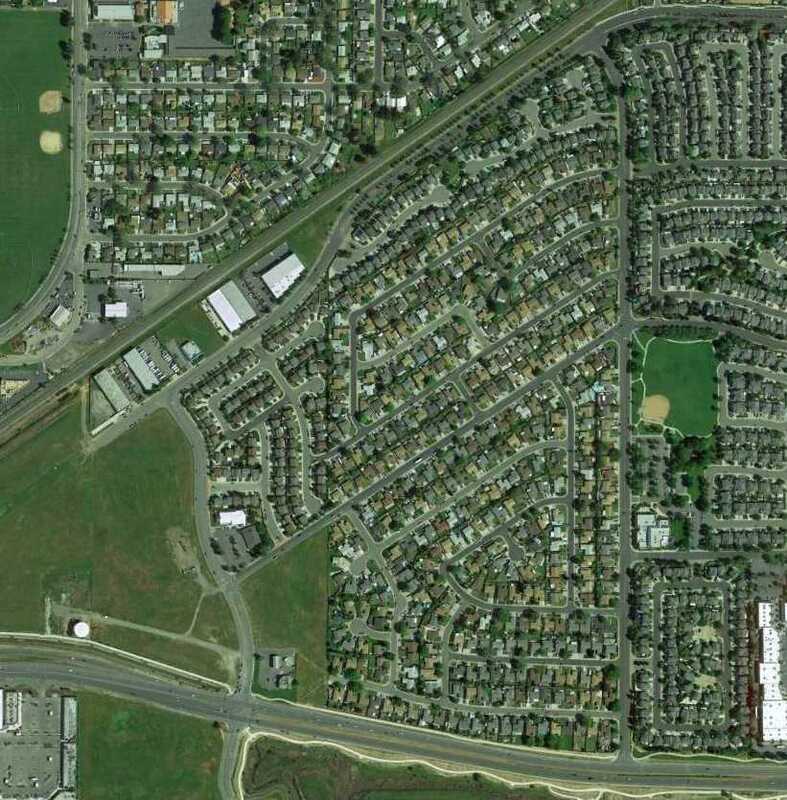 The site of Fairfield Suisun Air Park is located northwest of the intersection of Highway 12 & Village Drive. 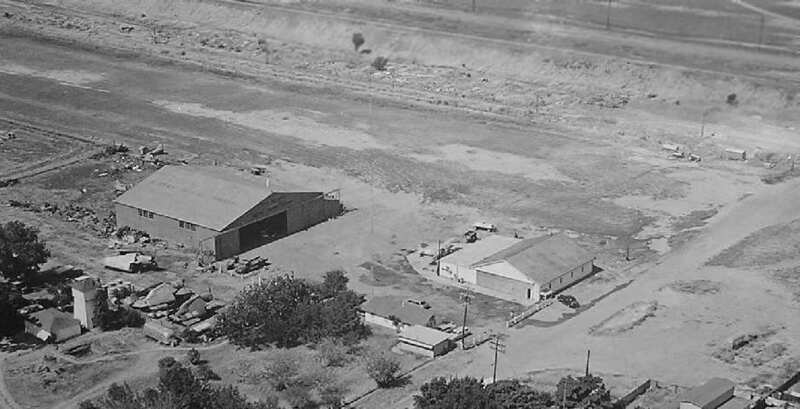 A circa 1955-56 aerial view of the Travis Aero Club Airport. 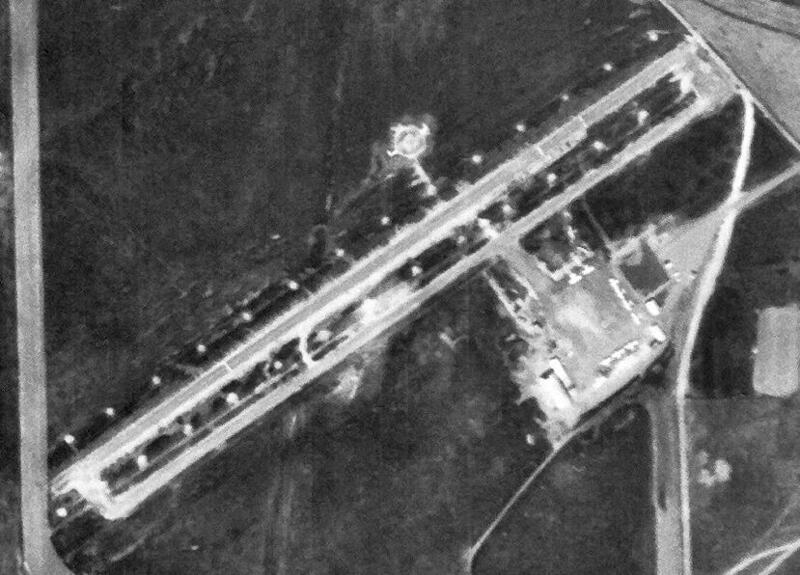 yet it was a completely separate & distinct airfield from the primary airfield on the base. It was created purely for the purposes of the base flying club. as it was not yet depicted on the 1953 USGS topo map. Wayne Bomar recalled, “My father, Maj. William Bomar, was a C-124 pilot at Travis from 1955-59. At age 15 I joined the Aero Club while it was still operating out of the Vaca-Dixon airport. which depicted several light civilian aircraft parked amidst a few small buildings. 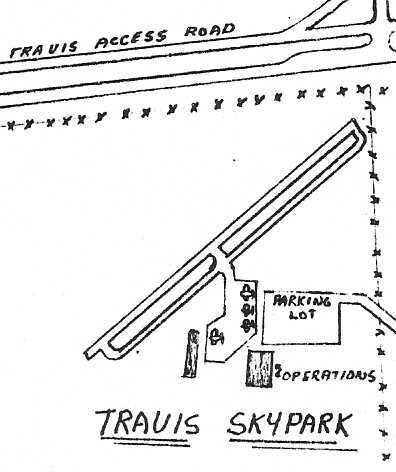 The layout of the Travis Skypark, from a 1957 brochure for the Travis Flying Club (courtesy of Wayne Bomar via Christopher Latham). It depicted the field as having a single northeast/southwest runway, parallel taxiway, and a ramp & 2 buildings on the southeast side. The Club was described as having 8 aircraft, including T-34 Mentors on loan from the Air Force. According to Wayne Bomar, “I soloed there [at the Travis Skypark] in 1957. The club acquired a 1928 Consolidated Fleet in 1958.
was on the April 1959 San Francisco Local Aeronautical Chart (courtesy of Paul Columbus). 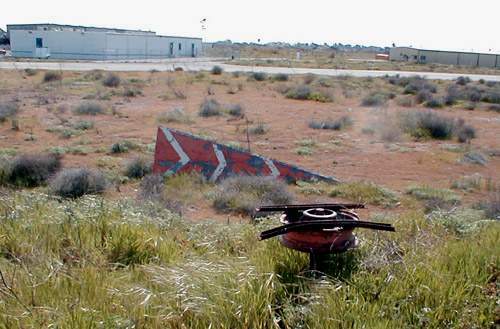 It depicted “Travis” as a private airfield having a 2,000' unpaved runway. depicted the field as having a paved runway & a crosswind unpaved runway. 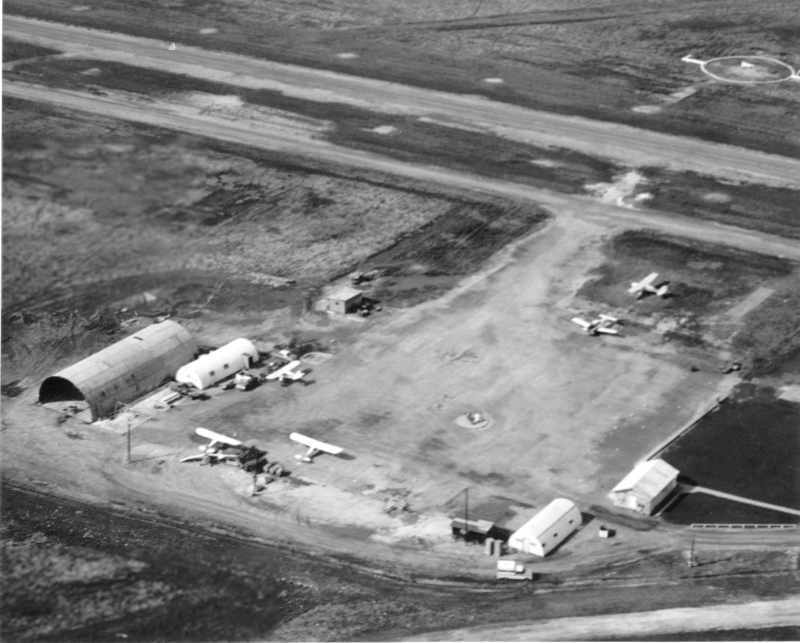 A 1965 aerial view of the Travis Aero Club Airport showed several light planes & several Quonset huts. the Travis Aero Club runway was an oil-topped surface. depicted the Travis Aero Club Airport as having a 2,000' unpaved runway. 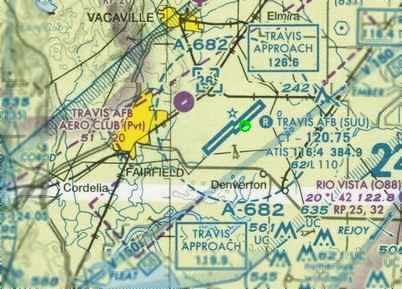 described the Travis Aero Club Airport as having a single 2,000' turf runway. and a cluster of small buildings on the southeast side. 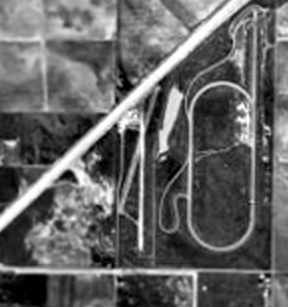 A 4/22/68 USGS aerial view depicted the Travis Aero Club Airfield as having a paved runway, parallel taxiway, and a ramp with 10 light aircraft. showed the field to consist of a single northeast/southwest runway, with a ramp along the south side of the field. as the 1980 USGS topo map depicted the field as having a single paved northeast/southwest paved runway. Christopher continued, “The club's condition around 2005-2006 was not good. and 60th Services Squadron hardly had any money to fix the airfield, the aircraft, and the clubhouse. We would have been closed within a year or two if we stayed. described the field as having a 2,000' asphalt Runway 4/22 & a 1,600' turf Runway 16/34. The field was said to have a total of 21 based aircraft, including 1 multi-engine aircraft. The manager was listed as Mike Caudell. 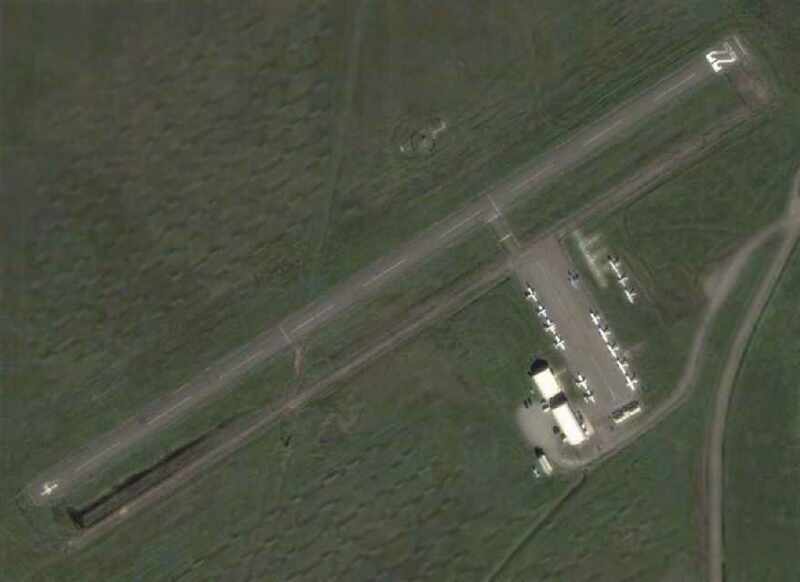 A 2005 aerial view depicted the Travis Aero Club Airport as having a total of 15 light aircraft visible on the field. A circa 2001-2006 aerial view looking north at the Travis Aero Club ramp. as a private field having a single 2,000' paved runway. A 2006 aerial view by Christopher Latham, looking northeast after departing the Travis Aero Club Airfield's Runway 22 in a Cessna. thus closing the last airport operated exclusively by an Air Force Aero Club. because it sits in the middle of land which has been determined to be important for “environmental” reasons. Yet that kind of logic is perfectly fine to justify closing an operating airport. “At the time of our closing, Runway 22/4 was 2,000' x 50'. Runway 16/34 was closed. because there was no room at the main base to relocate the aero club. flying around between C-5s, KC-10s & the new C-17s that are arriving at Travis. and we are the only one that cannot relocate (to the main base at Travis). Travis had no room for us on the ramp. Christopher continued, “Environmental was not the only reason. There was a piece of property on the departure end of [Runway] 22.
as long as the Travis Aero Club was still in operation. and a club house either at Nut Tree Airport in Vacaville or on the main base at Travis. (which we didn't want to because it would have caused a conflict of interest). plus there was no room at all on Nut Tree to build. Christopher continued, “So Rio Vista took us in with open arms. and there was room for us to build our hangars. We shut down operations at the Travis Aero Club field on April 15, 2006. I was the last flight out of there that day. we are currently waiting on a lease from the city so we can start building our hangars. I have a brand new 2006 Piper Archer III & a Cherokee 6XT with air conditioning & the Avidyne Entegra panels. I have 2 more Archers arriving late this year. 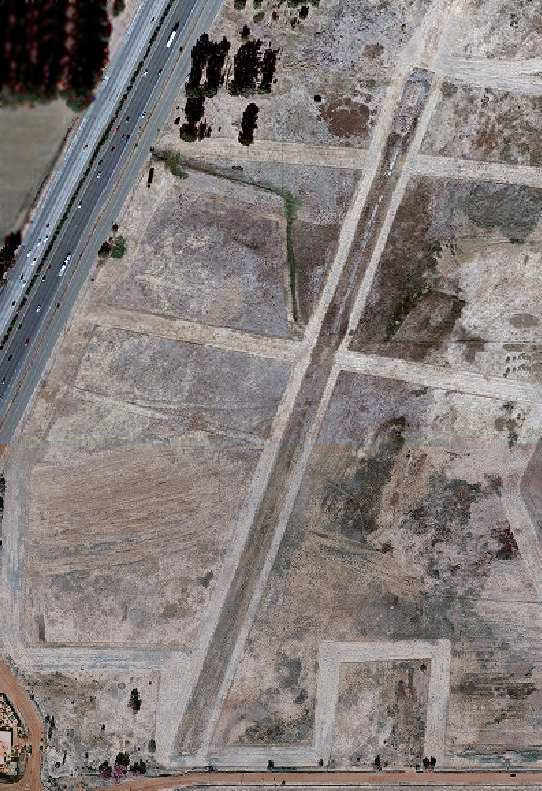 And on top of that, THERE ARE HOUSES ENCROACHING ON THE NEW RIO VISTA AIRPORT! That's pretty much the last chapter in the Travis Aero Club field. and showed 5 light single-engine aircraft parked on the ramp. 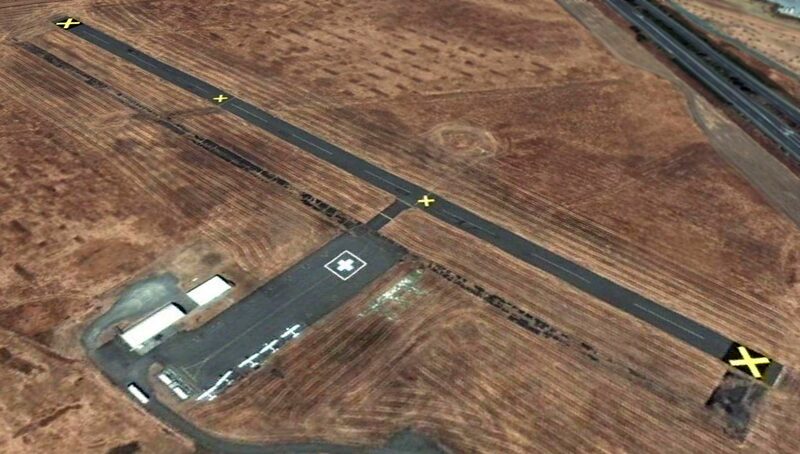 although closed-runway 'X' symbols had been pained on the runway within the previous 2 months. An August 2013 photo by Ron Plante looking southwest at the Travis Aero Club Airport. 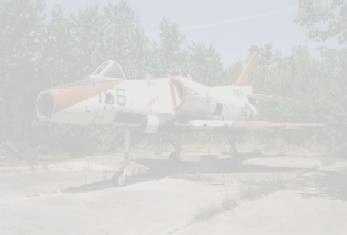 Ron reported, “All the buildings are gone, only 2 above-ground aviation gasoline tanks remain. An August 2013 photo by Ron Plante of the Travis Aero Club runway. A 2016 aerial view looking west showed the the Travis Aero Club Airport runway remained intact. The Travis Aero Club Airport is located northwest of the intersection of Hickam Avenue & Hospital Drive. Thanks to Vanessa Grigsby for pointing out the closure of this airfield. when they were used to transport seedlings from the facility to other parts of California. Photo is courtesy of Dan Lang of the CDF, via Dann Shively. 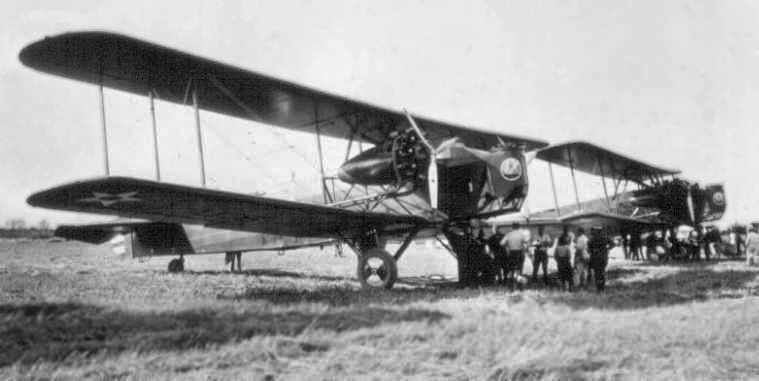 The date of the photo is unknown, but the Keystone B-3 did not enter service until late 1930.
or if the bombers just operated from an open grass area. According to Dann Shively, “The California State Nursery near Davis was established in the early 1920's. of 2 Army DeHaviland bombers which were used to transport seedlings from the facility to other parts of California. nor listed among active airfields in The Airport Directory Company's 1938 Airport Directory (according to Chris Kennedy). was on the 1939 Sacramento Sectional Chart (courtesy of Dann Shively). 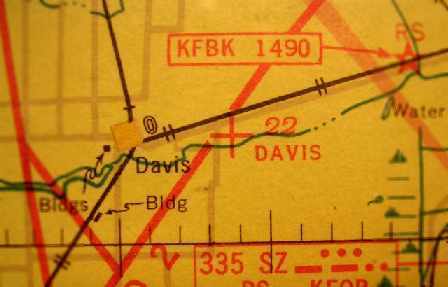 It depicted “Davis” as an auxiliary airfield. (courtesy of Dan Lang of the CDF, via Dann Shively). as that is how it was listed in The Airport Directory Company's 1941 Airport Directory (courtesy of Chris Kennedy). with the longest being the 2,608' east/west strip. A hangar was said to be marked with “State Forestry Airport”. depicted the field as “Davis”. 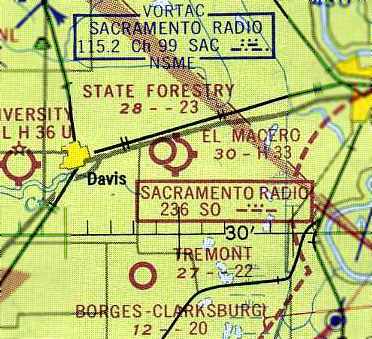 The 1946 Sacramento Sectional Chart (courtesy of Dann Shively) depicted “State Forestry” as an auxiliary airfield. 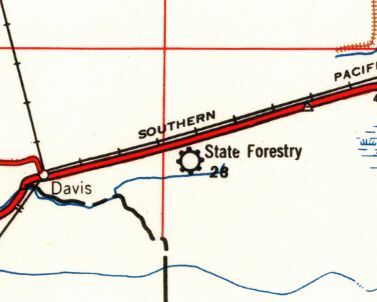 The State Forestry Airport, as depicted on the 1947 USGS topo map. depicted “State Forestry” as having a 2,600' unpaved runway. 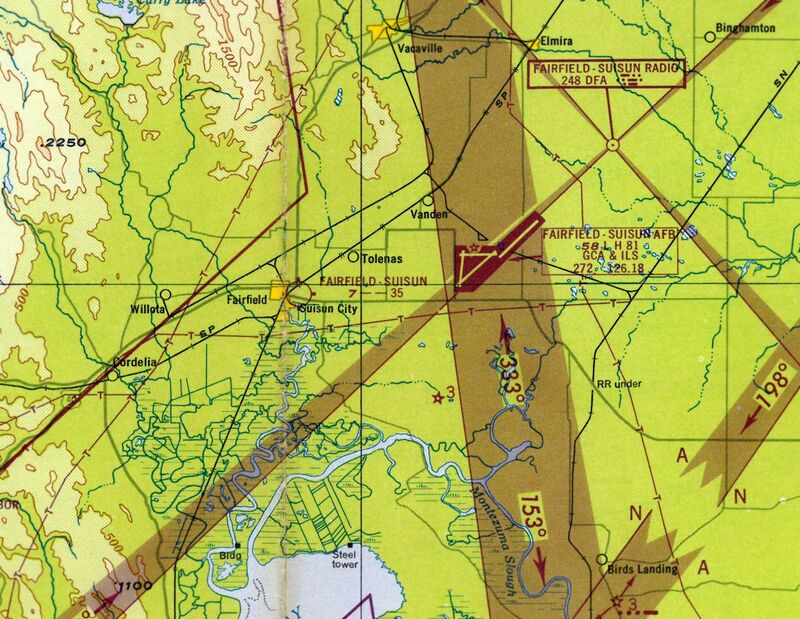 The 1952 USGS topo map did not depict the airfield at all. depicted the State Forestry Airport as having a 2,300' unpaved runway. 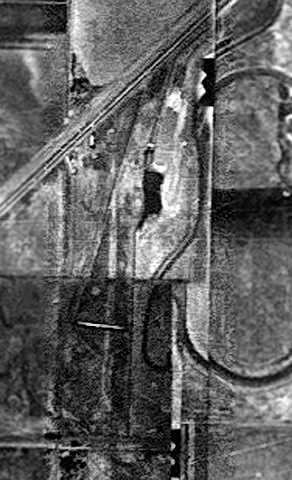 The last photo which has been located of the Davis State Forestry Airport was an 8/21/57 USGS aerial view. It depicted the State Forestry Airport as having a single east/west unpaved runway. was on the September 1962 Sacramento Sectional Chart (courtesy of Chris Kennedy). It depicted the State Forestry Airport as having a 2,300' unpaved runway. 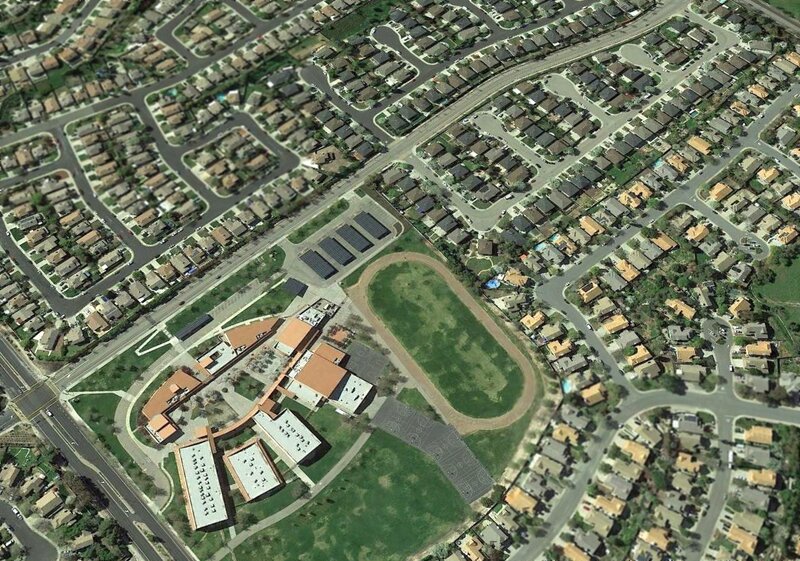 Note that it also depicted the new El Macero Field in very close proximity. as it was no longer depicted on the 1967 Sacramento Sectional Chart or the 1970 USGS topo map. 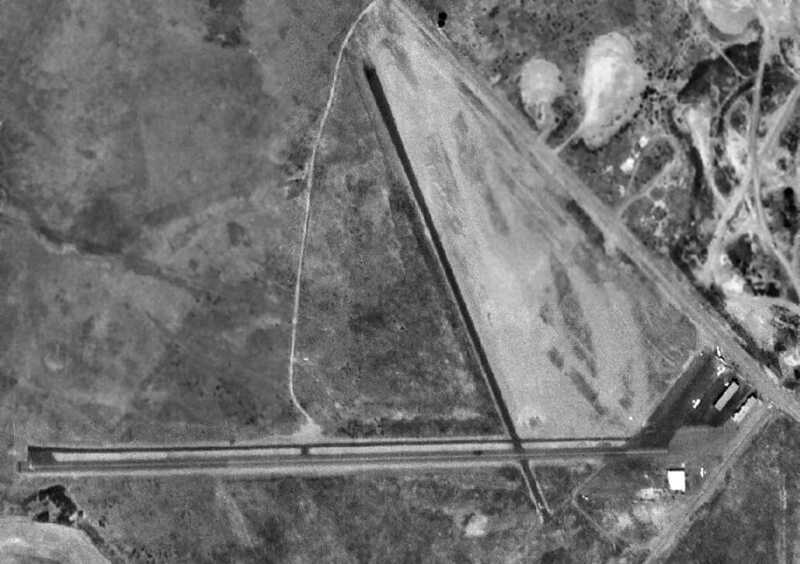 No trace of the airfield was visible on a 1970 USGS aerial photo. 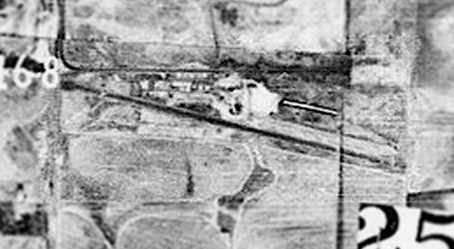 taken from the same perspective as the 1940 aerial photo. The site of the State Forestry Airfield is located south of the intersection of Interstate 80 & County Road 105. 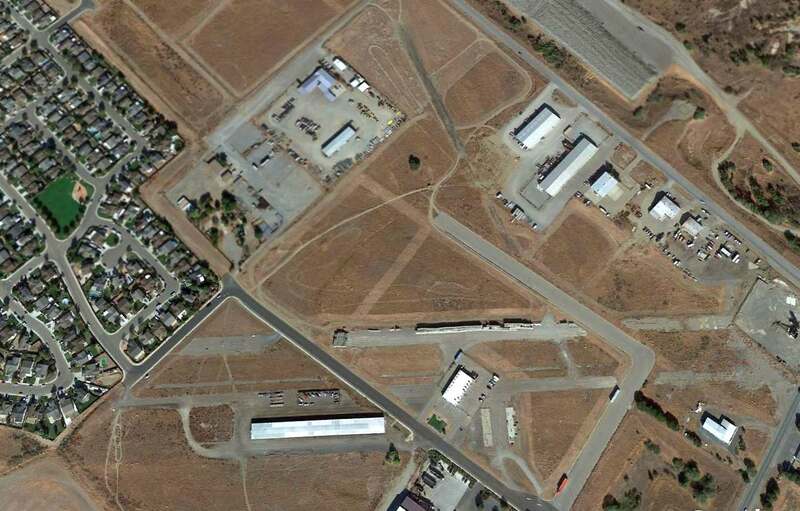 Thanks to Dann Shively for pointing out this airfield. 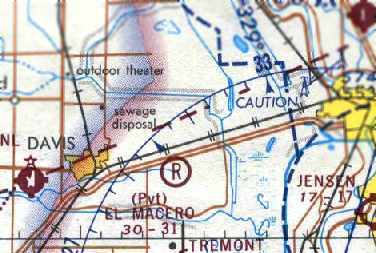 El Macero Airfield, as depicted on the September 1962 Sacramento Sectional Chart (courtesy of Chris Kennedy). No airfield was depicted at this location on the 1952 USGS topo map. According to Dann Shively, “In the 1960s a golf course & country club was developed on the east side of Davis. On the east end of the golf course was a small grass airstrip running north/south. 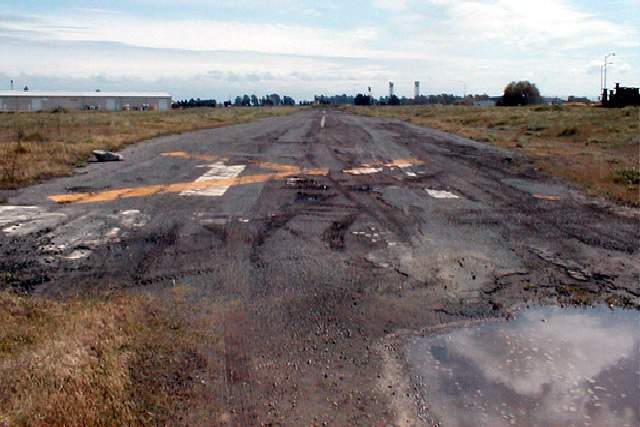 The date of construction of the El Macero Airfield has not been determined. It depicted El Macero as a public-use field having a 3,300' hard-surface runway. Note that it also depicted the California State Forestry Airport in very close proximity. 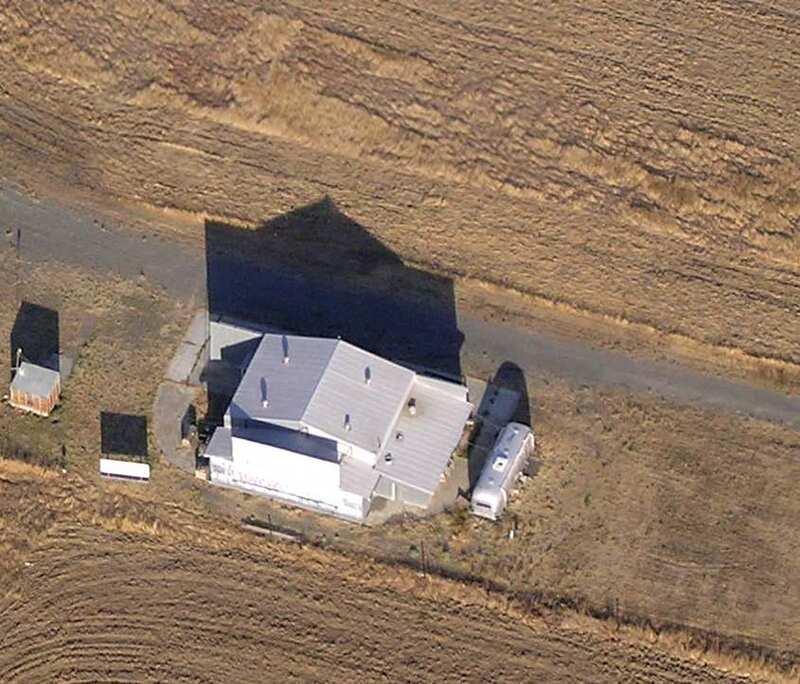 depicted El Macero as a private field with a 3,100' unpaved runway. 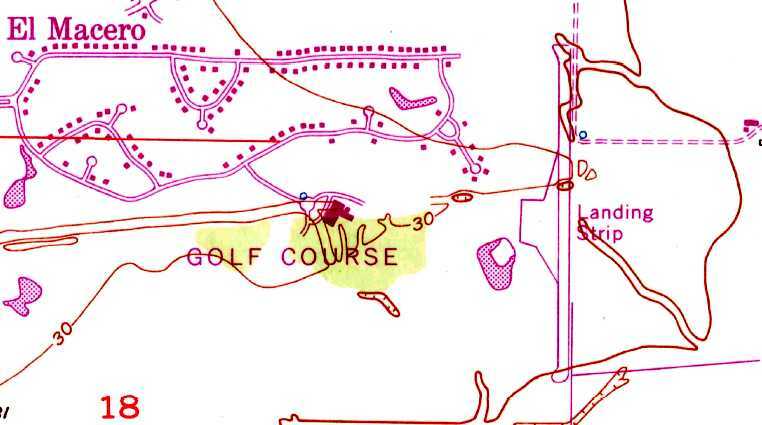 The 1968 USGS topo map depicted El Macero as a single north/south runway on the east edge of the golf course, labeled “Landing Strip”. Dann Shively recalled, “Although private, many pilots would use it for practice. There were no facilities there except for a windsock. 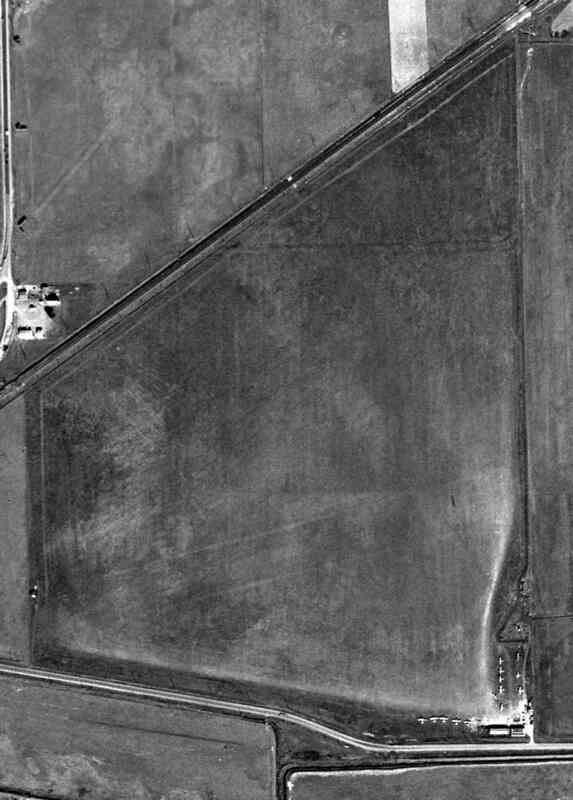 The only photo which has been located of the El Macero Airfield was a 3/21/70 USGS aerial view. and 1 light single-engine plane was visible parked along the west side of the midpoint of the runway. was on the 1970 Sacramento Sectional Chart (courtesy of Dann Shively). It depicted El Macero as a private field having a 3,100' unpaved runway. was in the 1980 AOPA Airport Directory (according to Chris Kennedy). It described the “El Macero Country Club” Airfield as having a single 3,100' turf Runway 16/34. as it was no longer depicted at all on the 1992 USGS topo map. 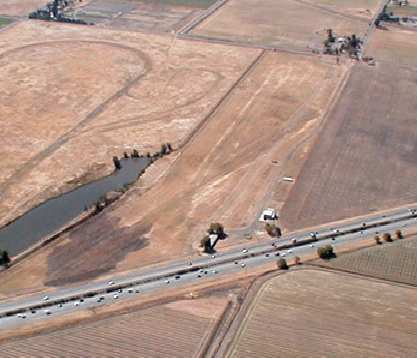 A 2006 aerial photo by Dann Shively looking north at the site of the former El Macero Airfield. Dann observed, “There is no evidence an airstrip existed. 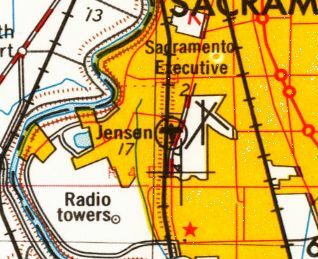 Jensen Airport, as depicted on a circa 1949-50 Sacramento city map (courtesy of Curtis Carroll, via Dann Shiveley). which honors Charlie Jensen (courtesy of Dann Shively). 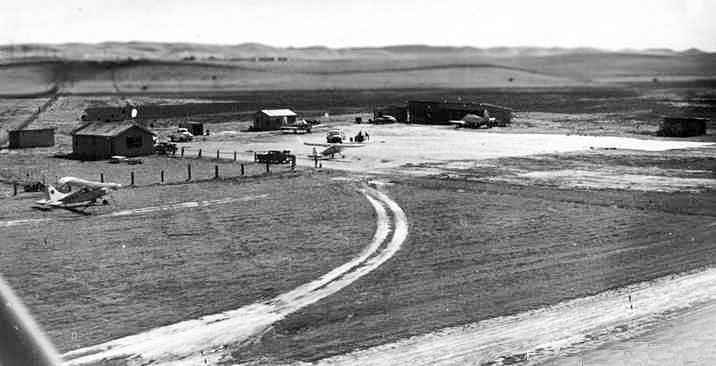 This small airport was built by agricultural aviation pioneer Charlie "Red" Jensen. and at 18, he became the first licensed airplane mechanic in California. although he also worked as an aerial advertiser, ran a charter service, operated a flying school & flew as a fire fighter. yet several times he used his flying skills to rescue injured fire fighters & miners & carry flood victims to safety. at what is now Sacramento Executive Airport. When a growing number of legal restrictions began to hinder his business, he bought land across the street from the airport & opened Jensen Field. City officials tried, but couldn’t stop the move. The date of establishment of Jensen Airport has not been determined. 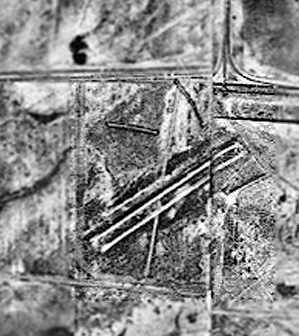 The earliest depiction which has been located of Jensen Airport was a 1947 aerial photo (courtesy of Dann Shiveley). 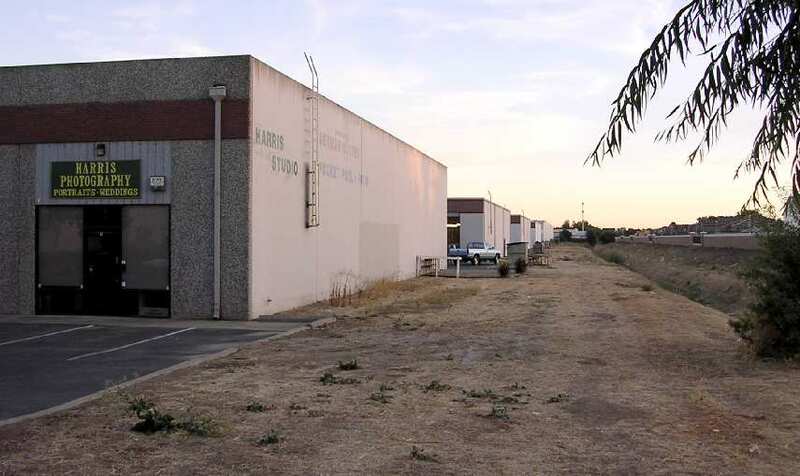 Dann Shively observed, “It clearly shows the airstrip & hangar with nothing around it but just a half block away from Sacramento Municipal Airport. It was mainly a crop duster field, but others kept their small planes there as well. Charlie operated from Executive Airport for years. He was kicked off because the cropdusting operation didn't mesh well with the airport (or so the city thought). They probably didn't like bull Stearmans taking off at 5:30am. So Charlie just bought up a bunch of land across the street & built his own airport. Kind of an 'in your face' move. It was a fun place to hang out. And the landings & takeoffs were always interesting. Some of the planes had no radios so you couldn't talk to the tower just down the street. It had a definite pattern that was smaller & lower than Executive Airport's. If you did contact the tower, it was for advisories only. The controllers couldn't clear you to takeoff or land; just let you know what was around you." 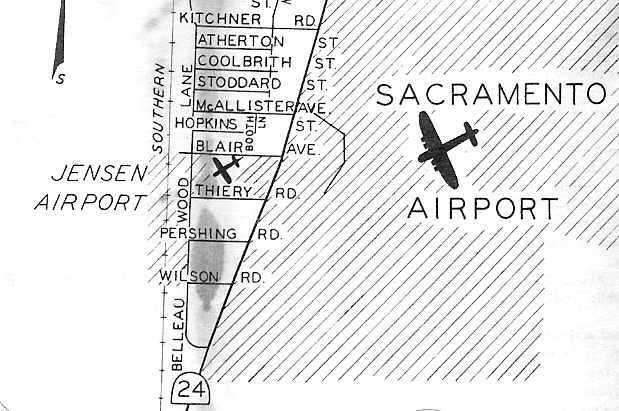 Jensen Airport was not yet depicted on the 1949 Sacramento Sectional Chart (courtesy of Chris Kennedy). Red Jensen flew his own Travelaire in Howard Hughes’ World War 1 movie "Hells Angels", for which he provided planes. At one point he had 53 planes in his fleet & he could fly them all. His membership in the Confederate Air Force was his pride & joy. 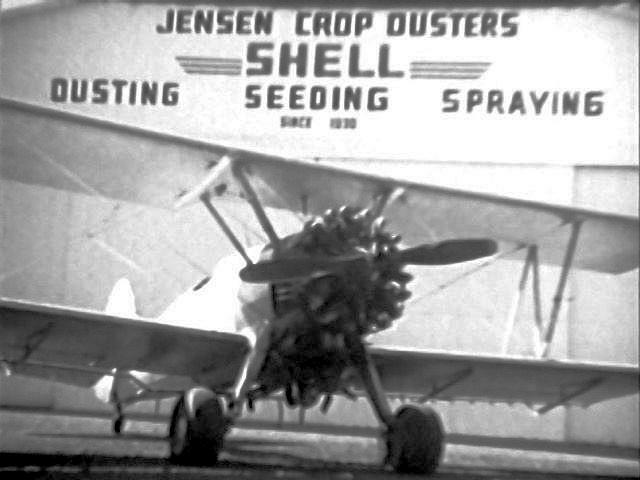 "Mr. Ag Aviation" was the title given Jensen by the California Agricultural Aircraft Association, which he founded. He held the California Department of Agriculture Aerial Applicator License Number 1. 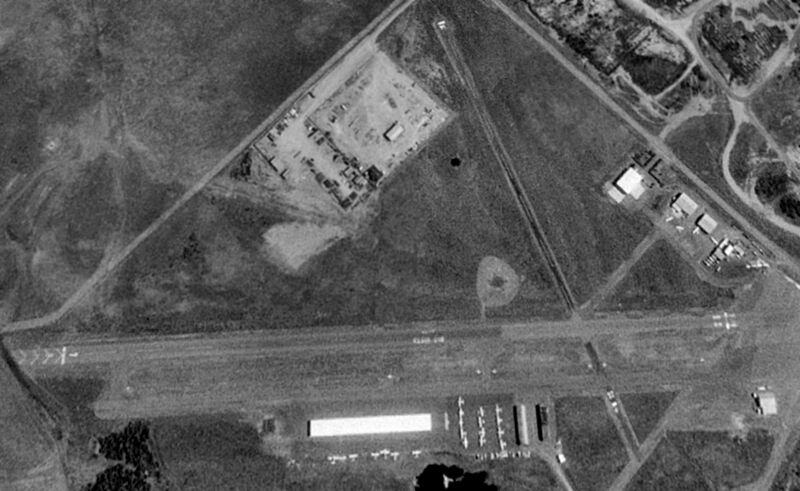 A circa 1950s aerial view looking southwest at Jensen Airport. Note the 3 TBM Avengers, with their wings folded, below the main hangar. Photo is used by permission of the Jensen family, courtesy of Dann Shively. depicted Jensen Airport as having a 1,700' unpaved runway. to receive the Lawrence D. Bell Helicopter Pioneer Award. Red saw helicopters as the future of agricultural aviation. He was planning a helicopter school. He had a dream, more than many men. Jensen Airport, as depicted on the 1957 USGS topo map. with 2 hangars on the northeast end, around which were parked a few aircraft. 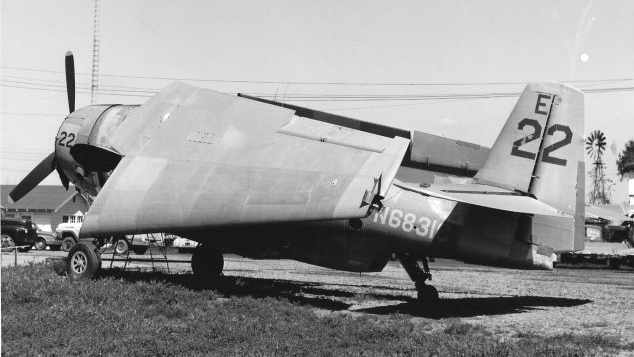 A 4/27/63 photo (courtesy of Bob Fish) of a TBM Avenger at Jensen Field. According to the plane's logbooks, it had been converted by Red Jensen into a waterbomber in 1962. This same plane is on display (as of 2004) on the USS Hornet museum in Alameda, CA. but the number of aircraft parked on the field had increased to a dozen. 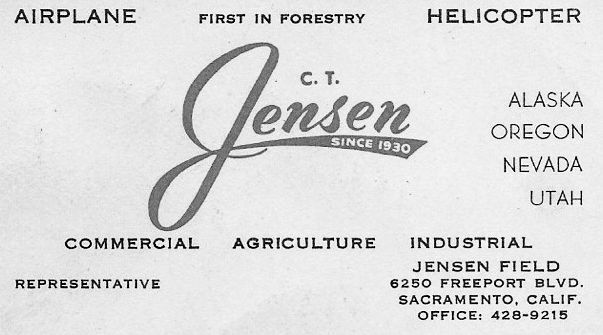 A circa 1960s business card for C.T. Jensen, (courtesy of Dann Shively). as having a 1,700' unpaved runway. Airbearfed recalled, “ I landed here once in 1970-71 to pick up a part for a TBM. 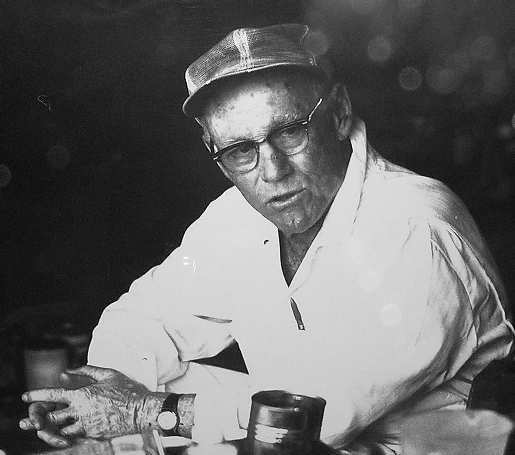 A 1974 photo of Charlie Jensen (used by permission of the Jensen family, courtesy of Dann Shively). 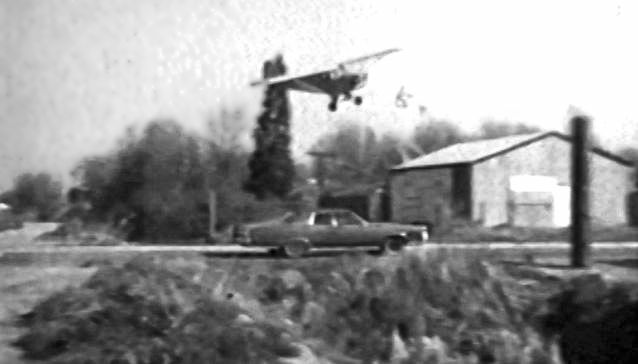 A 1975 photo looking east at Dann Shively landing his Aeronca Champ at Jensen Field (courtesy of Dann Shively). Dann recalled, “In the background is Charlie's junk pile; tanks, steel, containers etc. In the background the control tower from Sacramento Executive Airport can be seen. 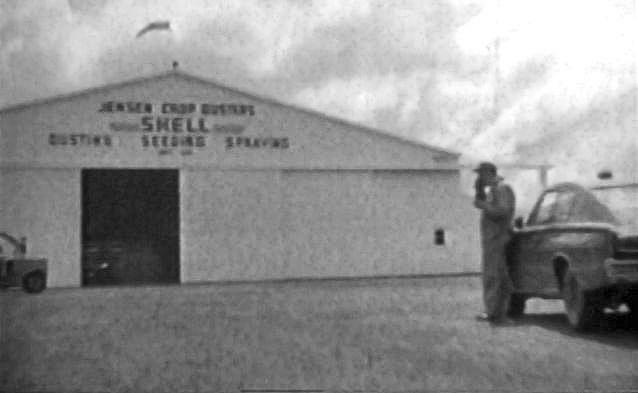 A still from a circa 1975 16mm film shot by Phil Schroeder at Jensen Airport (courtesy of Dann Shively), showing the machine shop & workshop. of “a Piper Cub landing. You can see that we scared a lot of motorists on the approach. “of Charlie eating lunch in front of the main hangar. A 1976 photo looking west at Dann Shively in his Bell 47 at Jensen Field, on the day he got his helicopter license (courtesy of Dann Shively). 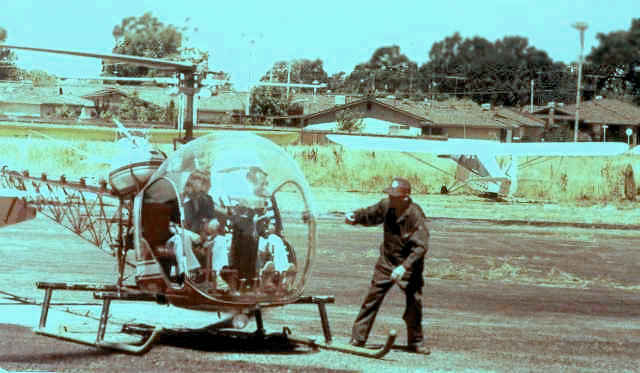 Dann recalled, “I took my future wife for a ride & landed over at Jensen to show Charlie, himself a helicopter pioneer. A 1980 aerial view by Dann Shively looking southeast at Jensen Field. Dann observed, “It shows Charlie’s big hangar with Executive Airport hangars in the background a block away. Just to the left of the hangar you can see one of his TBM bombers. The other 2 had been sold at this point. On the lower left was his shop building & just above that the little building that held the bathrooms. taken on the day of the auction of the aircraft & supplies of the late Charlie (Red) Jensen. "You can see the runway, shops & main hangar. You can see many of the aircraft & parts that were up for sale. There were mostly Stearmans, some Pipers & a couple of BT-13s. His 3 TBMs had already been sold." According to Dan Shively, Jensen Airport "closed after the owner's death in 1980. At the time of his death the field was home to about a dozen small planes & our own news helicopter. He was an amazing guy." with warehouses & a new street covering the site of the former airport. 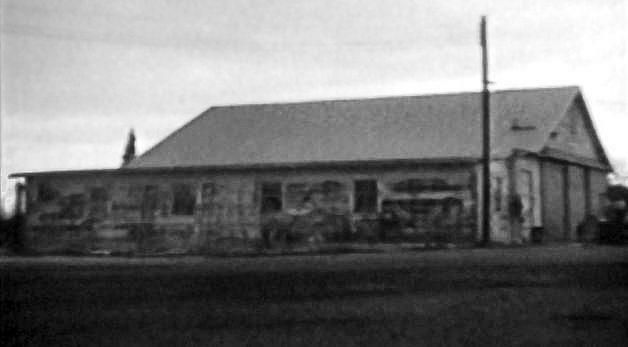 A 2003 photo by Dann Shively of the warehouse buildings that now sit on the location of the former runway of Jensen Airport. Dann Shively visited the site of Jensen Airport in 2003. "On the property now lies commercial buildings. There is no evidence an airport ever existed." 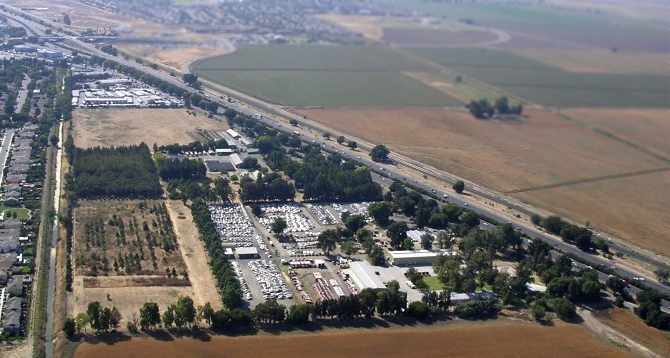 adjacent to the west side of Sacramento Executive Airport. 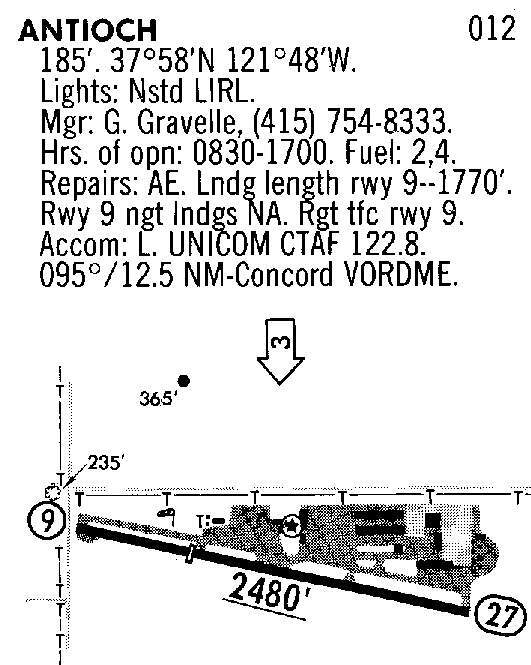 Vaca Dixon Airport, as depicted on the 1948 Sacramento Sectional Chart (courtesy of Jonathan Westerling). was on the 1948 Sacramento Sectional Chart (courtesy of Jonathan Westerling). It depicted the field as having a 2,500' unpaved runway. also described Vaca-Dixon Airport as having a 2,500' unpaved runway. as having 2 runways, oriented north/south & northeast/southwest. A 1955 CA Highways Map (courtesy of Kevin Walsh) depicted Vaca-Dixon Airport as having only a single runway. until their own airport was constructed. depicted Vaca-Dixon as having a 2,300' unpaved runway. 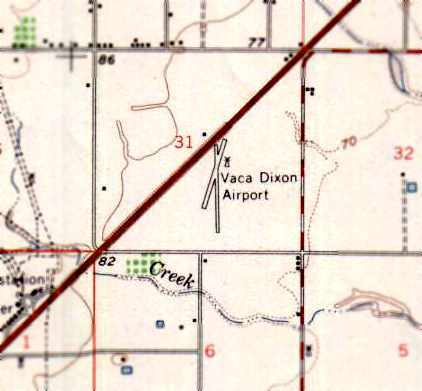 The 1962 AOPA Airport Directory described Vaca-Dixon Airport as having a single oiled 2,300' Runway 18/36. was an August 1964 photo by Bill Larkins of a Travel Air 4000 sprayer. depicted the field as having 2 unpaved runways. depicted Vaca Dixon Airport as having a 2,000' unpaved runway. with a single 2,060' "treated dirt" runway. 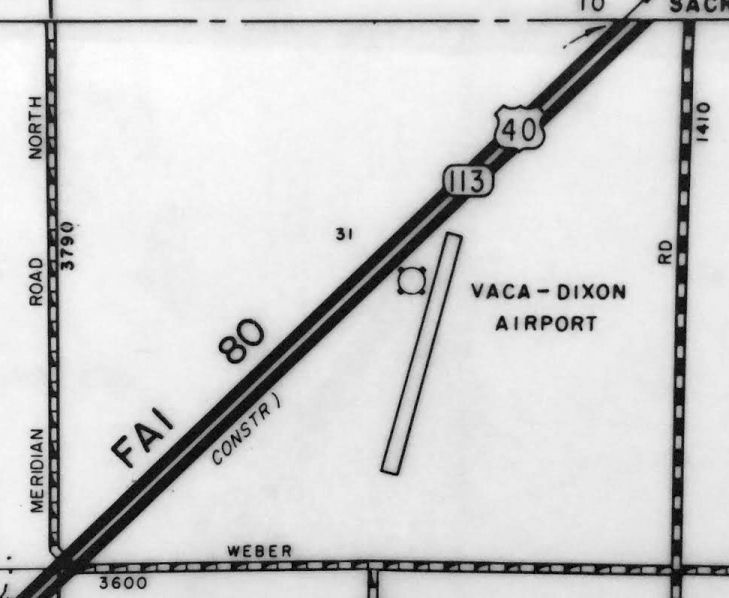 Vaca-Dixon Airport, as depicted in the 1968 Flight Guide (courtesy of Chris Kennedy). showed the field to have 2 runways & several buildings on the north side of the field. 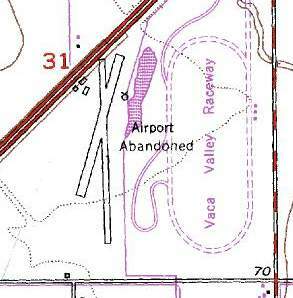 as the 1973 USGS topo map labeled it as "Airport Abandoned". the 1973 USGS topo map also depicted a 1,900' runway, oriented approximately 3/21. Three small buildings (hangars?) were also was depicted west of the northern runway end. as a total of 6 light aircraft were visible at the north end of the field. 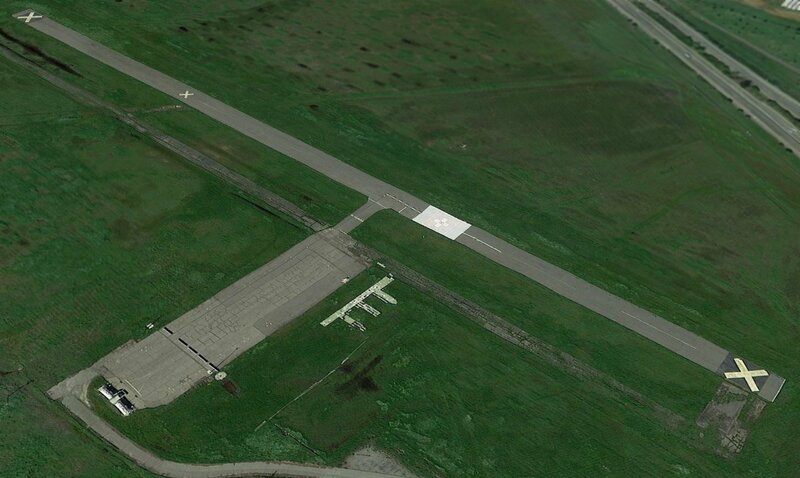 Vaca-Dixon Airport closed (for reasons unknown) in 1995.
the runways & hangar still existed, just devoid of any aircraft. 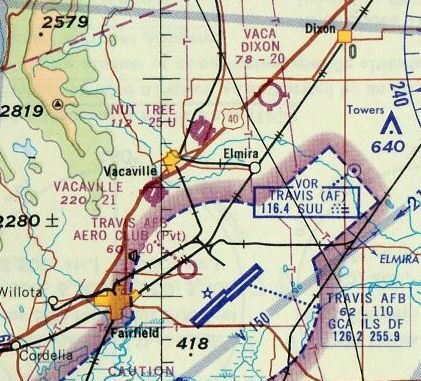 Vaca-Dixon was no longer depicted at all (even as an abandoned airfield) on 2002 aeronautical charts. A 2003 aerial view by Jonathan Westerling, looking southeast at the remains of the Vaca-Dixon Airport. A 2003 aerial view looking west at the former Vaca-Dixon Airport, by Dann Shively. A 2003 aerial photo by Dann Shively, looking southeast at the hangar which remains at the former Vaca-Dixon Airport. Dann Shively flew over the former Vaca-Dixon Airport & visited the site at ground-level in 2003. "It's hard to even see the runways from the ground as they're pretty much overgrown. I did manage a shot from the south looking north. 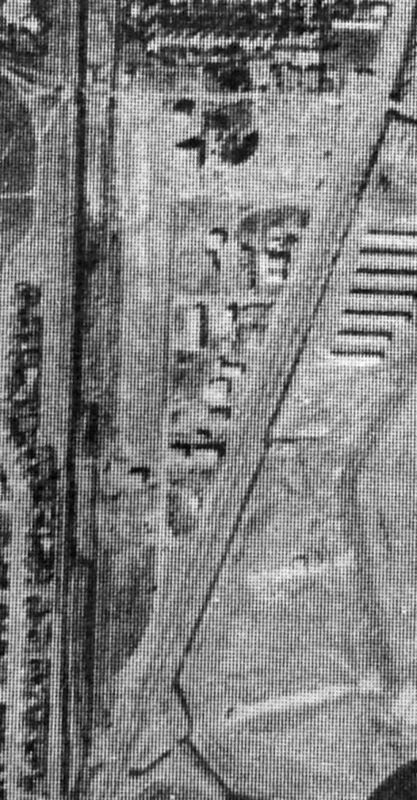 It shows the buildings shown in John Westerling's aerial shot. There's a large white container box on the left. and on the north end another building that may have been the office." The airport site is adjacent to the southeast side of Interstate 80, north of Weber Road. 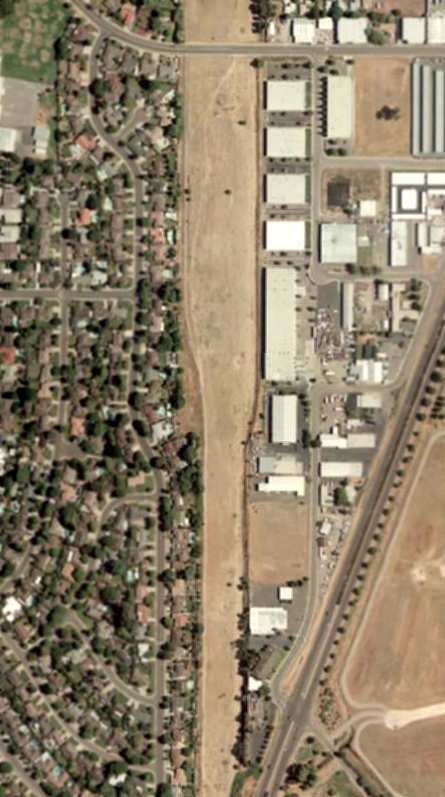 The Vaca Valley Raceway is adjacent to the airport site to the east. Vacaville Gliderport, as depicted on the 1957 Sacramento Sectional Chart (courtesy of Chris Kennedy). this airfield was originally a private field known as the Shady Grove Airport. The date of construction of Shady Grove Airport has not been determined. 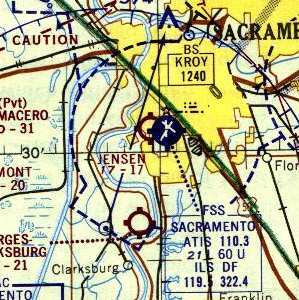 on the 1951 USGS topo map nor on the March 1954 USAF Sacramento Sectional Chart (according to Chris Kennedy). as that is how it was labeled on the 1957 Sacramento Sectional Chart (according to Chris Kennedy). It was described as having an unpaved 2,000' runway. and listed the operator as George Kotsotas. 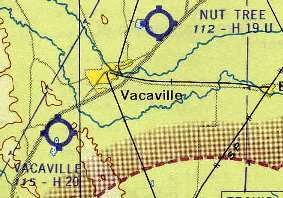 depicted Vacaville Airport as having a 2,100' paved northeast/southwest runway. 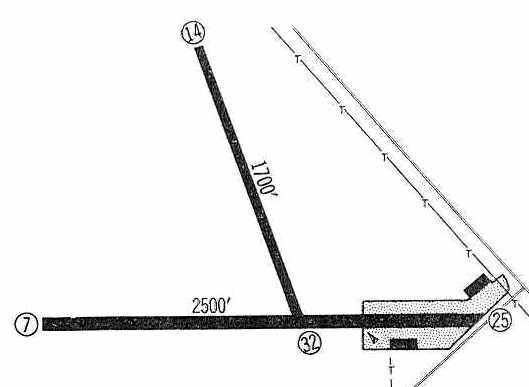 with a single 2,100' asphalt runway. 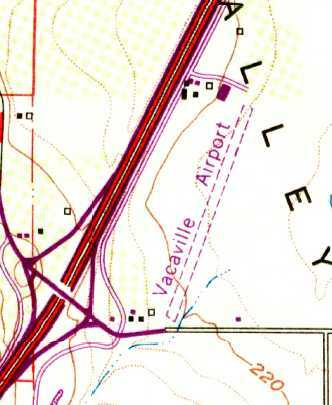 The 1968 USGS topo map depicted the Vacaville Airport as havin a single northeast/southwest unpaved runway with several buildings on the northwest side. 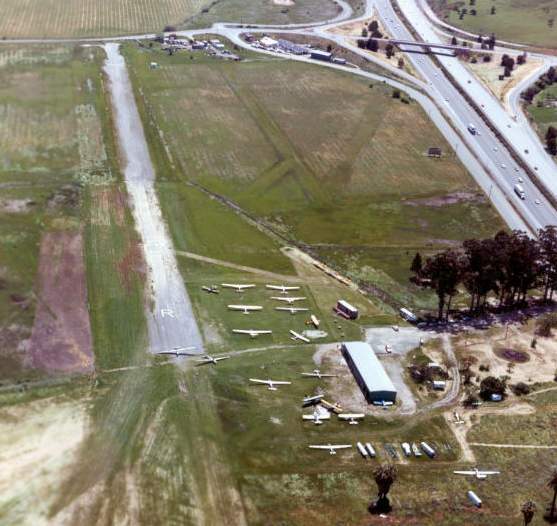 The earliest photo which has been obtained of the Vacaville Airport was a 1970 (from the Alexandria Digital Library @ UC Santa Barbara, courtesy of Jonathan Westerling). It showed the field to have a single northeast/southwest runway with a hangar on the north side of the field. under the name of Vacaville Soaring. showed a total of at least 19 aircraft (mostly gliders) around a small building on the northwest side of the field. as that is how it is depicted on the 1980 USGS topo map. One small hangar also was depicted west of the northern runway end. or Vac-Aero (appropriate because it was the site of an old Mexican land grant & pueblo homestead, hence vaquerro). 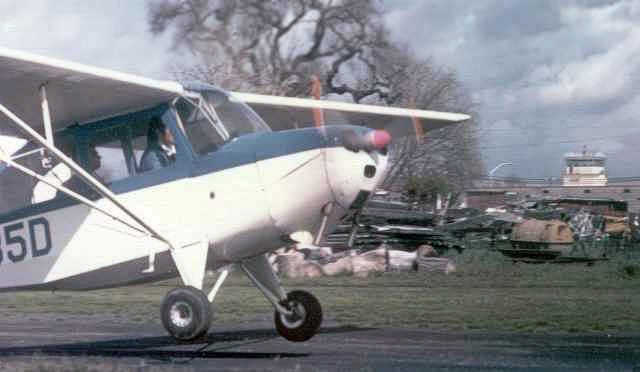 An early 1980s photo by Patrick Burke of N88281, a 1974 Bellanca 7KCAB at Vacaville Gliderport, with an unidentified biplane & Cessna 150/152 in the background. the field was apparently well used, as a total of at least 19 gliders & single-engine aircraft are visible on the field. In 1984, the field was taken over by Dr. Mayes & Lagoon Valley Soaring. with 11,000 glider tows per year being conducted from the site. leaving his son, Rex Mayes, to operate the airport. with a single 2,100' paved runway. where it operates now under the name Valley Soaring Association. 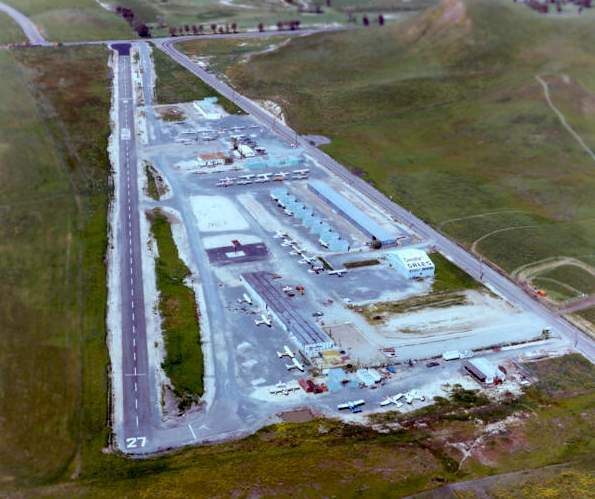 The Vacaville Gliderport closed in 1994.
the runway still existed in a somewhat deteriorated state, but no buildings remained standing. 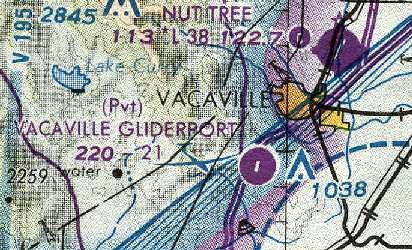 Vacaville Gliderport was no longer depicted at all (even as an abandoned airfield) on 2002 aeronautical charts. 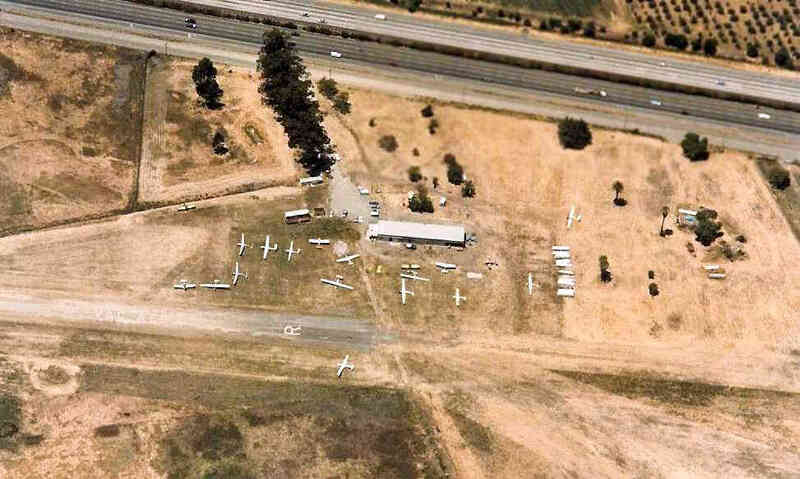 A 2003 aerial view by Jonathan Westerling, looking southeast at the remains of the Vacaville Gliderport runway. 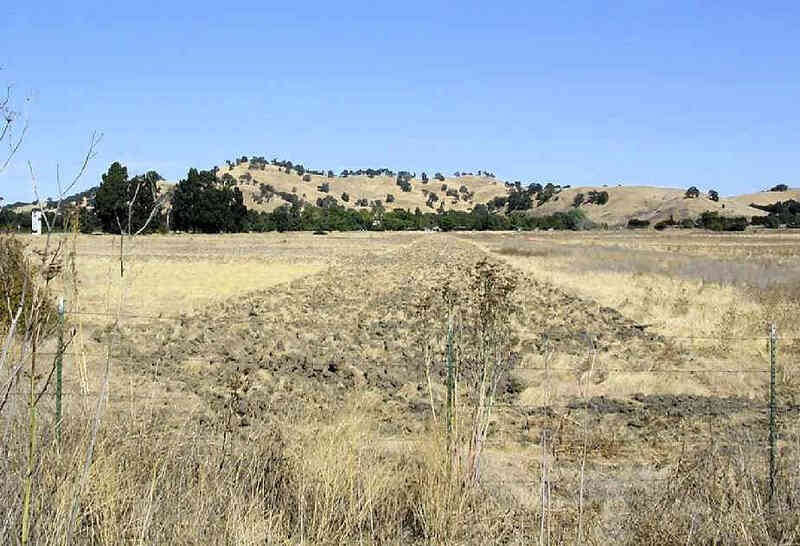 A 2003 photo by Dann Shively, looking east at the remains of the Vacaville Gliderport runway. "As you you can see the runway still shows signs of being plowed years ago. Nothing is left of the airport. The office & hangars were near the big trees on the left of the photo. This area is a pristine part of nature between Fairfield & Vacaville in a little valley. There were huge plans to develop the area commercially in the early 1990s. plans progressed but were eventually shelved because of a downturn in the economy. Now, it appears those plans are on the move again. So presumably at some time all traces will be erased." 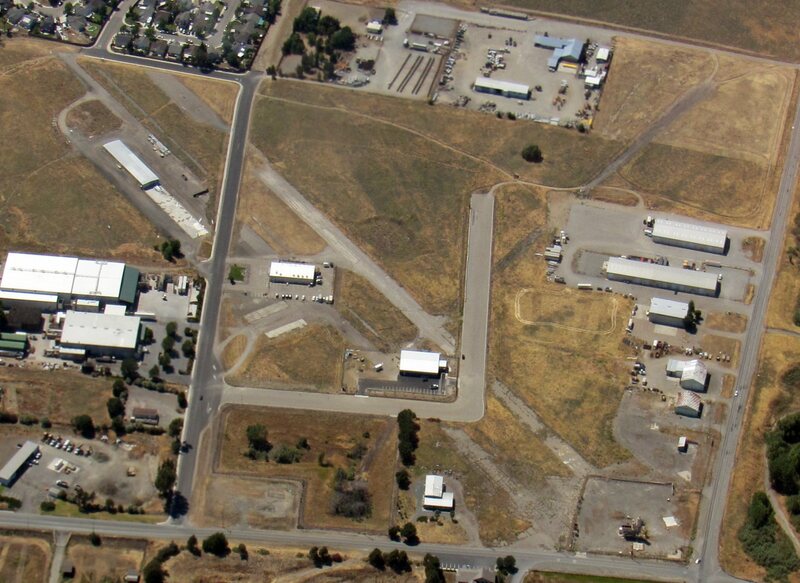 The airport site is adjacent to the east side of Interstate 80, north of Lagoon Valley Road. 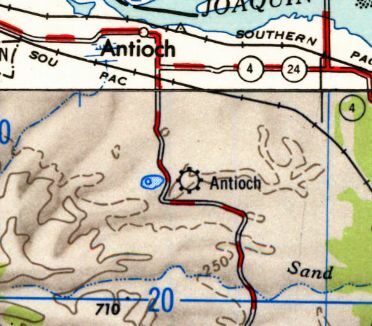 Antioch Airport, as depicted on the 1947 USGS topo map. as it was not yet depicted on a 1939 aerial photo nor on the 1946 San Francisco Sectional Chart (courtesy of Dann Shively). 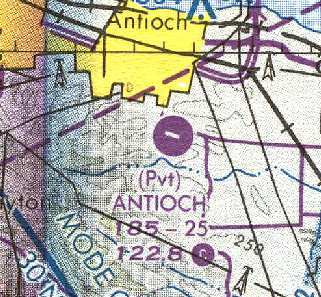 The earliest depiction which has been located of the Antioch Airport was on the 1947 USGS topo map. According to K.O. Eckland, in 1948 the Antioch Airport consisted of a 2,100' dirt runway. 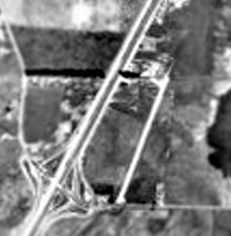 The earliest photo which has been located of the Antioch Airport was a 1949 aerial photo. It depicted Antioch as having 2 unpaved runways: one oriented east/west & another oriented northwest/southeast. A hangar & a single light aircraft were visible on the north side of the field. was on the 1954 San Francisco Sectional Chart (courtesy of Dann Shively). 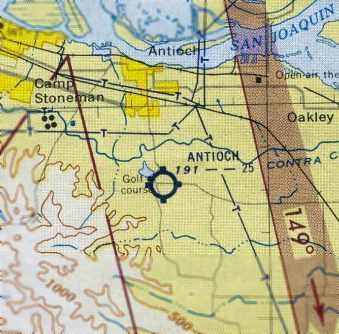 It depicted Antioch as having a 2,500' unpaved runway. 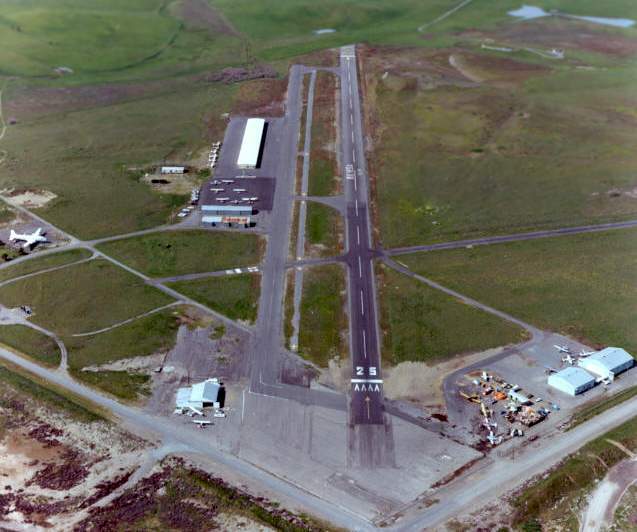 described Antioch Airport as having 2 runways, with the longest being a 2,500' oiled strip. depicted the field as having 2 runways: one oriented east/west & another oriented northwest/southeast. and the number of aircraft parked outside had increased to 6. Donna Demarest reported that her father, Dave Demarest, started “'Little David's Sky Circus” at Antioch. at which time only the Eastern half of the runway was paved. 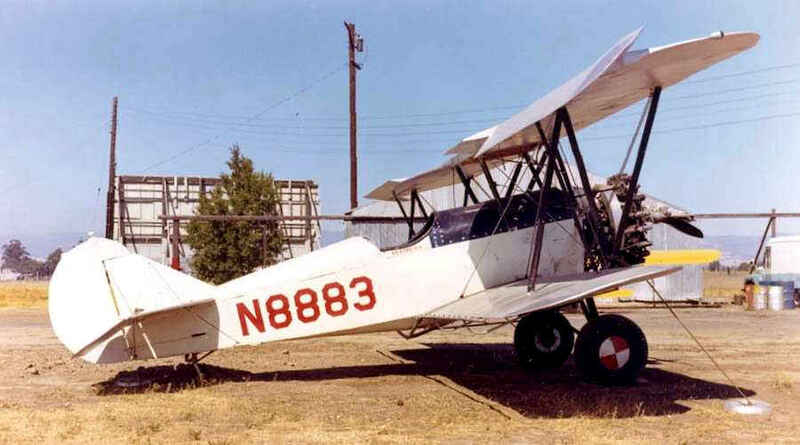 There was an older man named Bass McKinney, who had a J-3 Cub on the airport when my father bought the place. He had been involved with the airport at its founding, which I think was centered around a flying club. and included the note "Skydiving N of the runway." Terry Graham recalled, “When I moved from my mother’s home in Texas to the Airport on January 1, 1964, the runway was paved full length. There was a pilot’s lounge & office between the red-roofed building & the runway about midfield. The red roof building was the original shop & we lived in a small mobile home just to the north of it. The tarmac extended westward as can be seen in your photo, with the fuel pumps on the west edge of the tarmac. and there were only 2 rows of aircraft tie-downs behind to the East of the red roofed building. My father developed the skydiving business until it became the premier West Coast operation, famous all over the World. Dave Demarest, indeed, was involved & led the club for years; while we ran the operations. the former east/west runway was no longer apparent, with the northwest/southeast runway being the only one then evident. A 5/26/69 USGS aerial view showed that the number of aircraft parked outside at Antioch had increased to over 20. 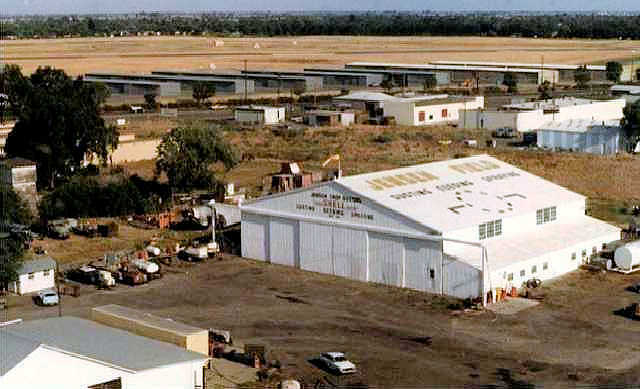 Antioch airport was home of a bustling parachuting operation in the late 1970s. The target area was in a field across the road. the field was apparently well used, as a total of at least 30 aircraft were visible on the field. According to Terry Graham, “Jerry [Graham, airport owner] was a bigger than life personality who you either loved or hated. There are many stories & intrigues surrounding my father’s life; and all are true to some extent. He sold the airport sometime in the early 1980s to a retired football player/ investor, Gordon Gravelle. the Fixed Base Operator at Antioch was Tedco Aviation. 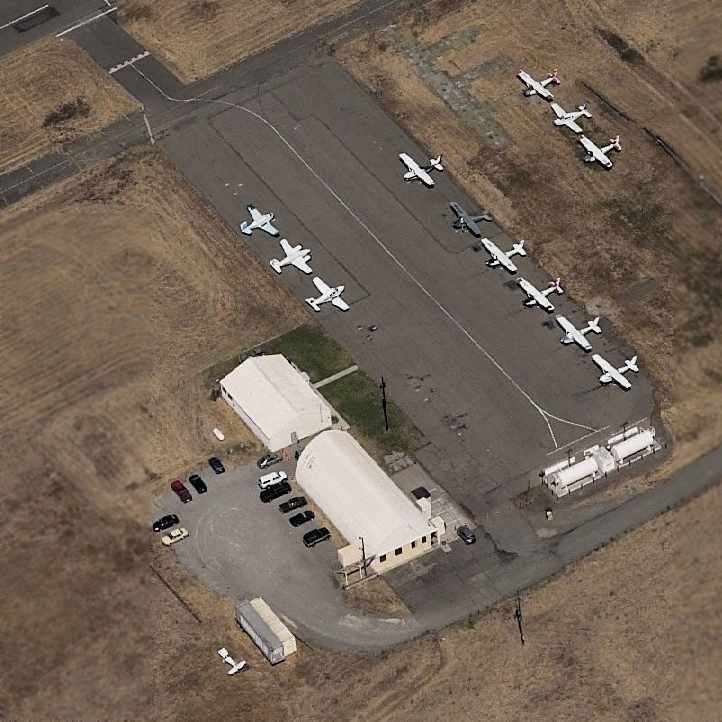 According to Terry Graham, Tedco was evidently Antioch's FBO after the airport was sold by Jerry Graham. a parallel taxiway, ramp, and several hangars. was on the 1990 San Francisco Sectional Chart (courtesy of Dann Shively). It depicted Antioch as a private airfield with a single 2,500' paved runway. Antioch Airport was evidently closed at some point between 1990-93.
as a 1993 USGS aerial view looking southwest showed that the airport had already been closed, but the airfield remained largely untouched. 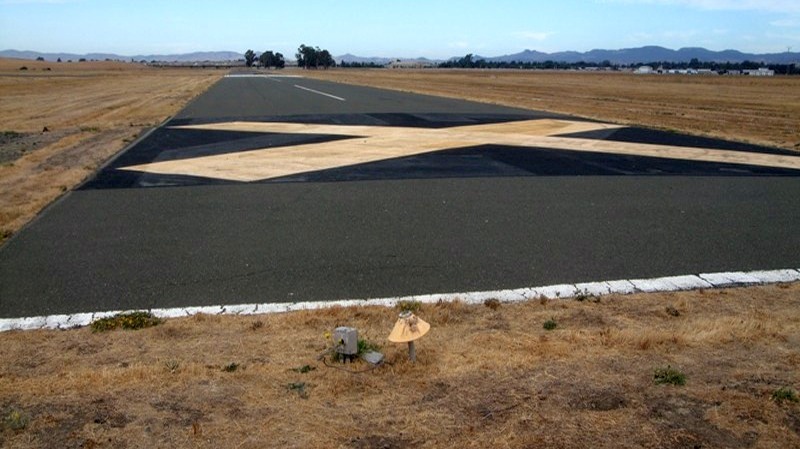 The closed Antioch runway was used in 1993 by a radio-controlled model aircraft club. in the north face of the long hangar building along the runway on the East end of the airport. 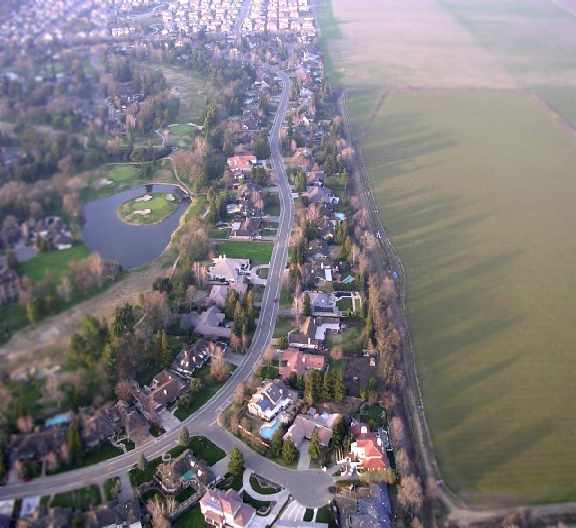 A 2001 aerial photo showed that the Antioch Airport site had been completely redeveloped with a housing development. now a high school & housing development. since according to the recent aerial photographs, it was being actively redeveloped. I was hoping that I could get there while the east half of the property still retained some of the historic airport structures. Unfortunately all remains of the airport have been obliterated. The west half of the property is part of a massive housing development called "Black Diamond Canyon". The eastern half is now a just-completed high school." Terry Graham reported in 2009, “Today, all the surrounding hills have been bulldozed & used as fill for new residential developments. A 2017 aerial view looking southwest shows no trace remaining of Antioch Airport. Antioch Airport was located southeast of the present-day intersection of Mount Hamilton Drive & Golf Course Road. 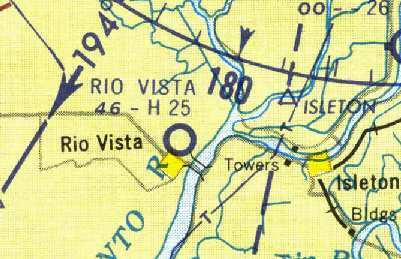 The original Rio Vista Airport was labeled simply as a “Landing Strip” on the 1952 USGS topo map. as it was not yet depicted on the 1946 Sacramento Sectional Chart (courtesy of Dallam Oliver-Lee). 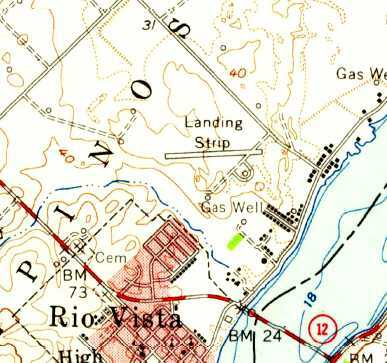 The earliest depiction of Rio Vista Airport which has been located was on the 1952 USGS topo map. It depicted a single paved east/west runway, labeled simply as “Landing Strip”. 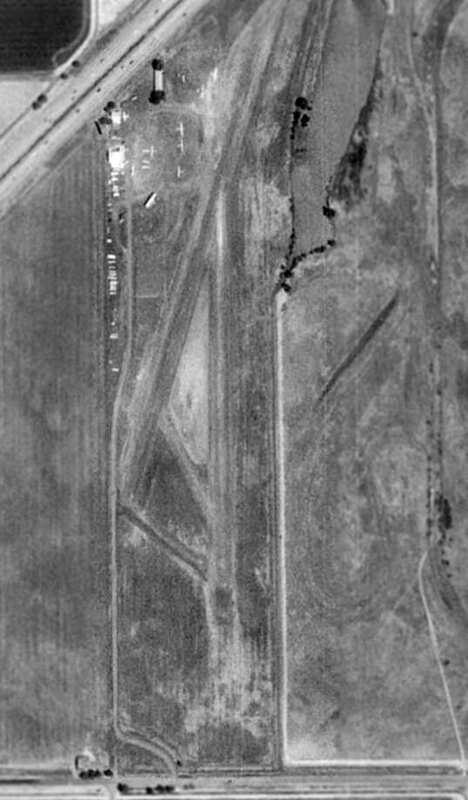 The earliest photo of Rio Vista Airport which has been located was a 10/15/52 USDA aerial photo (courtesy of Dallam Oliver-Lee). It depicted the field as having 2 runways (oriented east/west & northwest/southeast). An 8/23/57 USDA aerial photo (courtesy of Dallam Oliver-Lee) depicted Rio Vista as having 2 paved runways (oriented east/west & northwest/southeast). Two small buildings & 3 light aircraft were visible on the southeast side of the field. along with a ramp on the southeast side with 2 buildings. 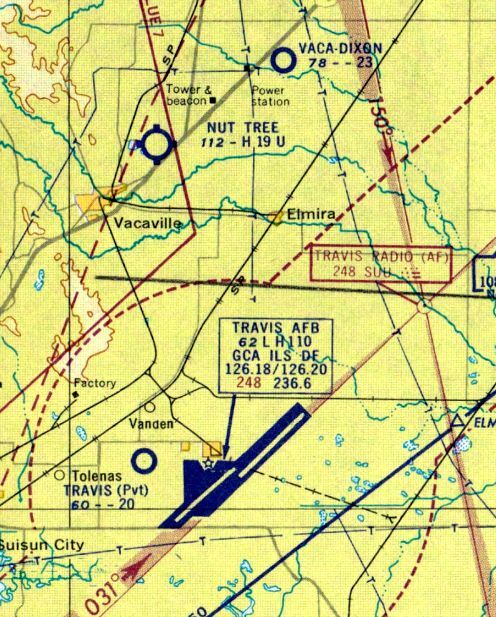 The 1961 Sectional Chart (courtesy of Dann Shively) depicted Rio Vista as having a 2,500' hard-surface runway. 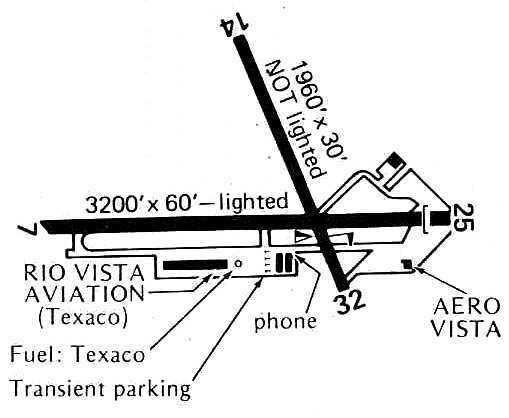 The 1962 AOPA Airport Directory described Rio Vista Airport as having 2 runways. The 1966 USGS topo map continued to depict a single paved runway, labeled simply as “Landing Strip”. with a single 2,180' asphalt runway. and showed 3 single-engine aircraft parked outside. The 1969 USGS topo map depicted 2 paved runways, but still labeled simply as “Landing Strip”. depicted the field as having 2 paved runways. Rio Vista Airport, as depicted on the 1976 Pilot's Guide to CA Airports (courtesy of Chris Kennedy). as having 2 paved runways: the 3,200' Runway 7/25 & 1,960' Runway 14/32. A 1978 aerial view depicted 6 light aircraft on the field. 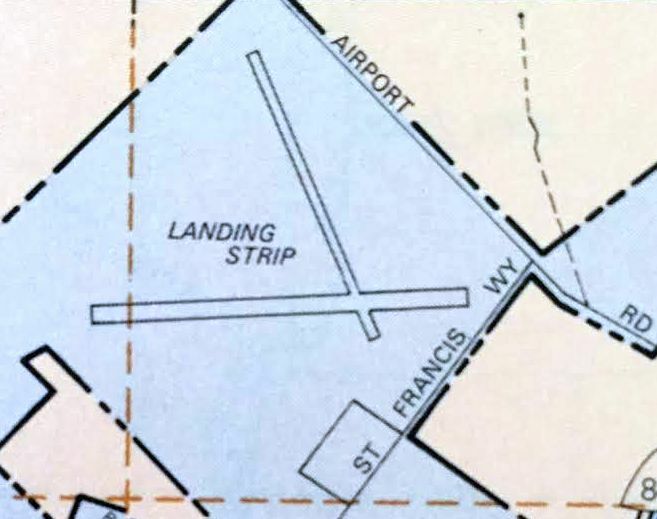 A 1982 street atlas (courtesy of Kevin Walsh) depicted the original Rio Vista Airport as 2 runways labeled simply as “Landing Strip”. Aerial view of the original Rio Vista Airport in 1982, looking west, copyright by John Hockenbury (used by permission). “It occupies an approximately 0.5-mile square tract of land situated on the northern edge of the city. and a shorter, narrower crosswind runway, aligned NNW/SSE. as a total of at over 20 aircraft were visible on the field. Ramps along the south & east sides of the field had several hangars. 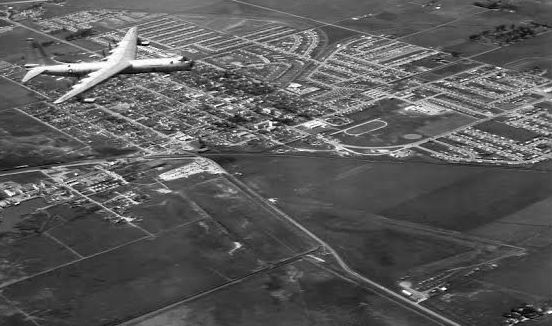 when it was replaced by the new Rio Vista Municipal Airport, 2 miles to the northwest. 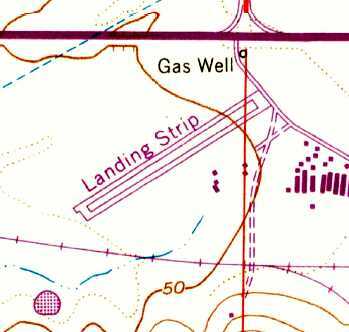 The original field was still depicted as an abandoned airfield on 1998 aeronautical charts. 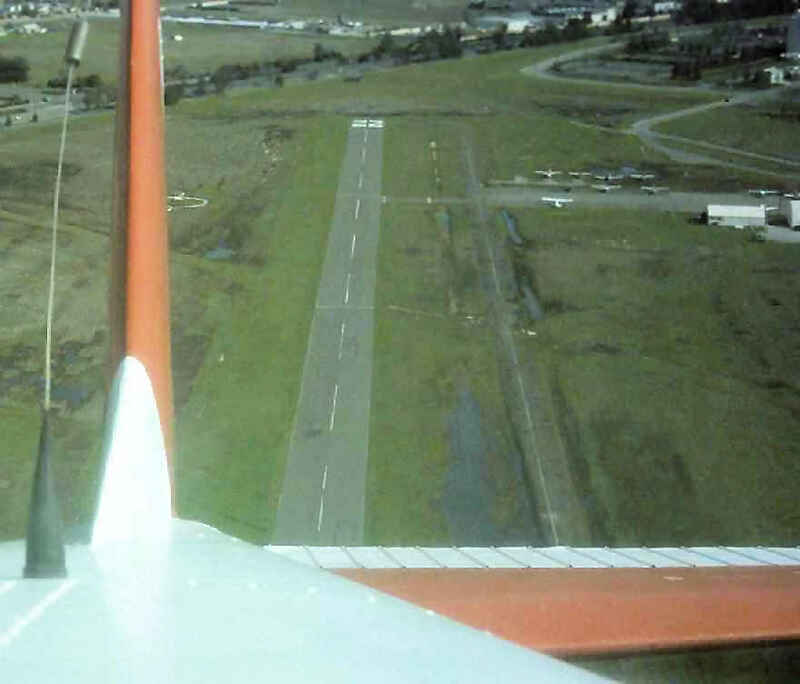 A 2003 photo by Jonathan Westerling, "Looking up the old Runway 14 at the original Rio Vista Airport. This was the smaller (1,900') cross runway of which only the northern 1,000' remain intact." the primary runway at the original Rio Vista airport." but still indicates landing Runway 25." Jonathan Westerling visited the site of the original Rio Vista Airport (as well as the new Rio Vista Airport) in 2003.
it is because the city has built a brand new airport to take its place. 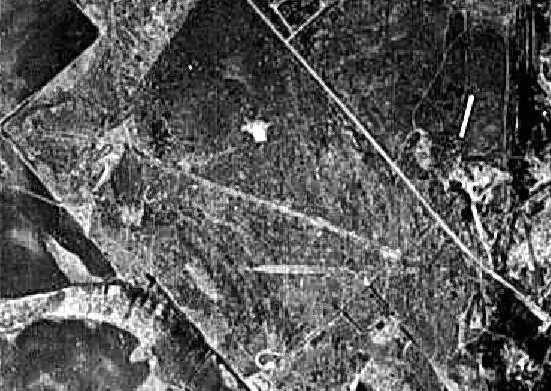 a new airfield was constructed just 2 miles north of the old one. but aging & restricted geographically from further growth. the decision was made to invest in a new field rather than upgrade the old one. and a new police station have been built on the property. The easiest place to view the old runways is from the intersection of Airport Rd. & St. Francis Way." 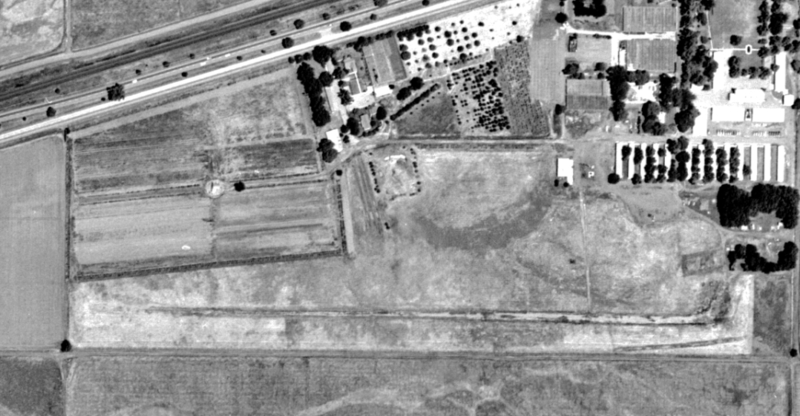 A circa 2006 aerial view looking west at the remains of Rio Vista's Runway 25 (with markings still visible) & several hangars. A 2015 aerial view looking north showed portions of several runways & several hangars remaining at the site of the original Rio Vista Airport. A 6/2/18 aerial view by Gonzalo Curiel looking northwest at the remains of the original Rio Vista Airport. showing portions of several runways, taxiways, ramps, and several hangars which remain.